Unfortunately it looks like a wet Thursday morning commute. CINCINNATI, OH (FOX19) - Unfortunately it looks like a wet Thursday morning commute. The rain will not be heavy but it will be rainy-day-slow. Showers will increase tonight and taper off tomorrow, ending during afternoon. Before then there will be breaks in the rain. Friday morning will be dry with considerable cloud cover. 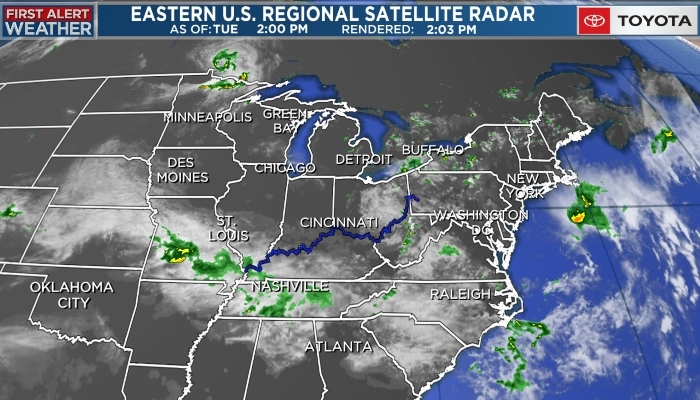 The cloud cover will head southeast and as drier air invades our region, the cloud cover will thin through the day and by late afternoon the sky will be partly cloudy. Saturday will have a cold, frosty start and a cool, sunny afternoon. Winds will become more southerly by Sunday morning and with some cloud cover the morning will not be as cold. Clouds will slowly increase Sunday and the air will warm to the upper 50s ahead of a system bringing rain and a wet Monday to the Tri-State. After the showers end Tuesday, Wednesday will clear and that brings us to Opening Day. The models have been consistent it looks dry and cool for the Findlay Market Parade and close to 60 degrees for the Reds game.